There are few things in this world that I love more than the anticipation of a dinner with a full plate of gyoza to share with someone that appreciates those succulent little dumplings just as much as I do. 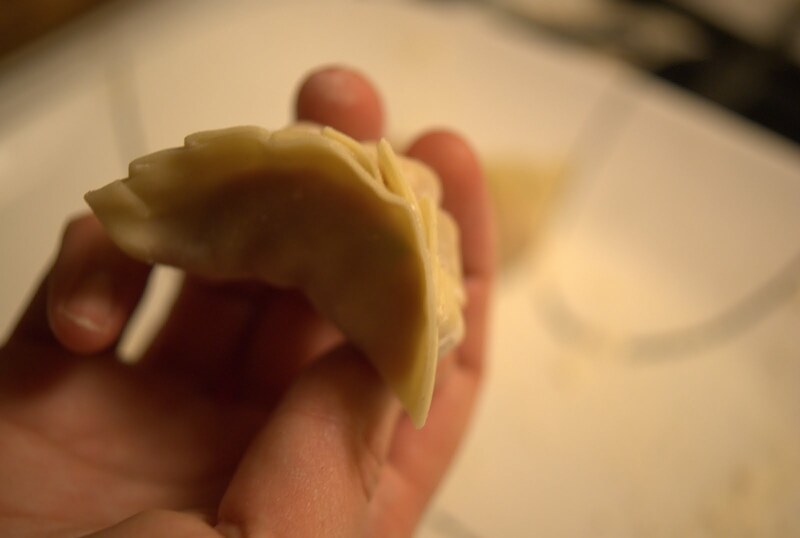 They're fun to make, they're easy to make yourself, and they usually result in what one would call a gyoza coma. My own father loved gyoza so much that he gave my mother the nickname of "gyoza bum." Not sure what I should really draw from that one, but I think of it fondly. So, how to make gyoza? Well, my mother's recipe follows this one almost exactly. First off, when making the recipe, I recommend doubling the quantity. I do this for two reasons. 1) I like to make a lot of gyoza at once, freezing about half of the amount to safely whip out when I need something special to eat. 2) It makes sense to double the quantity because when shopping for ground pork, odds are you're more closely going to buy something portioned to about a pound. Also, on this particular occasion, I'd like to note, that we used some excellent ground pork, a pound from our pork sampler purchased from Jen and Pete's Backyard Birds. The pigs at Jen and Pete's are allowed to forage and run around like crazy for their short period on this earth, and then when it's close to closing time, they're encouraged to plump up on generous amounts of barley. The package itself says "finished with barley" indicating that the pigs were allowed to feed on the grains at the end (not that there's actual barley mixed in with the sweet meat). 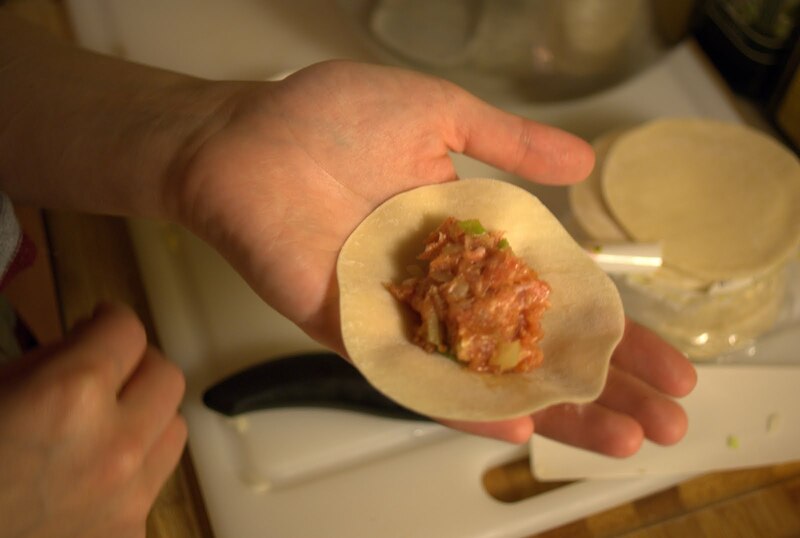 There's a second variation we apply when mixing the pork filling, that might be of interest to you. I find that if you boil the chopped cabbage in a dashi, then there's a much more round flavor to the filling. 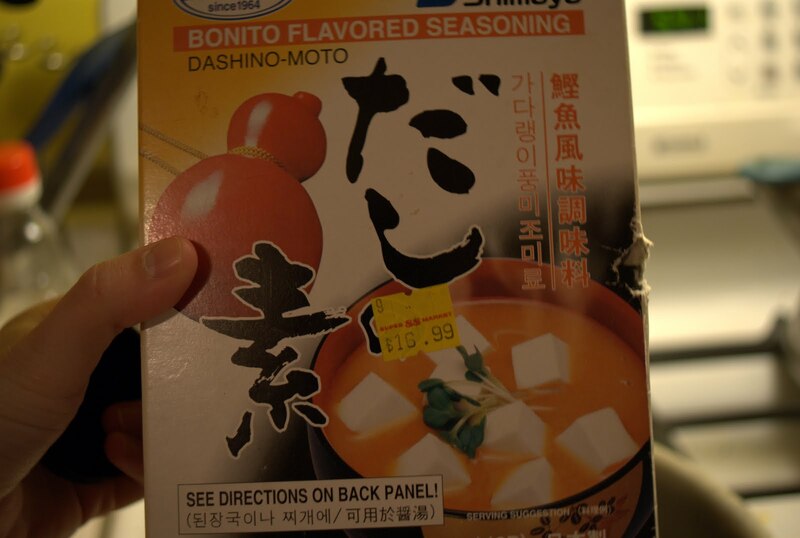 It adds salt content and umami flavor to the entire dish. For those who don't know, you can purchase a bonito base in a box like the one shown, add a tablespoon or two of the little particles to your water, and there you have a nice stock to flavor your chopped cabbage. Step 1: Take a skin into the palm of your hand. 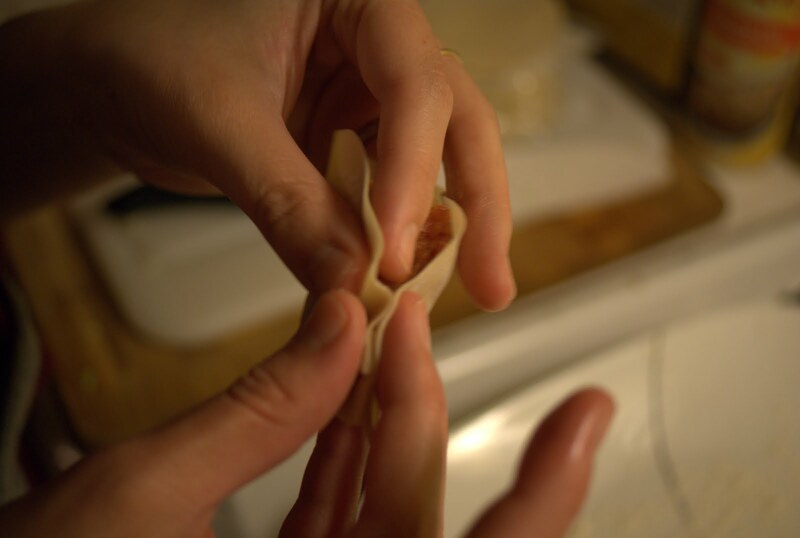 Dip your pointer finger into a little dish of water, and rub it around the circumference of the round dumpling skin. Step 2: Take a teaspoon of your pork filling mixture. Trust me, a teaspoon, only slightly more. 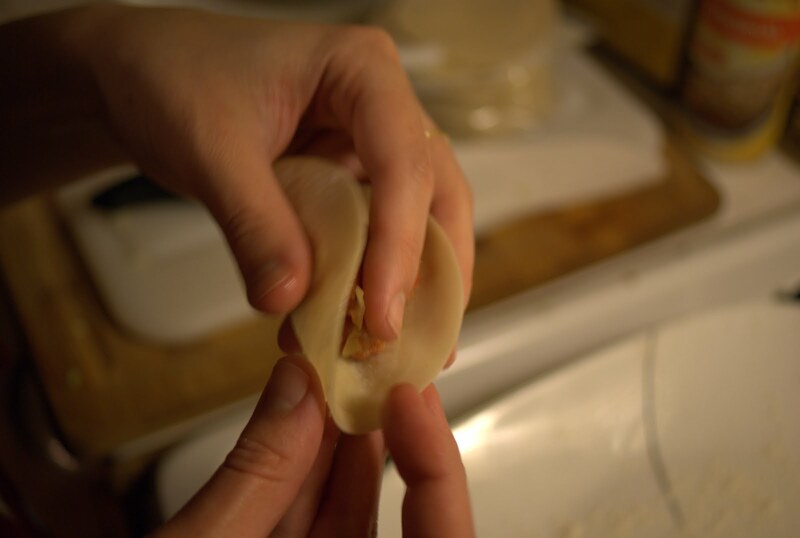 Less will make it easier to make nicely sealed dumplings. Step 4: Create the little creases, coaxing a little fold with your left hand's pointer finger on one side of the skin, and your right hand's thumb on the other side of the skin. Now, with your left hand's thumb, you can press down over the little fold that you've created. That's all there is to it. About five creases should create a sealed dumpling. 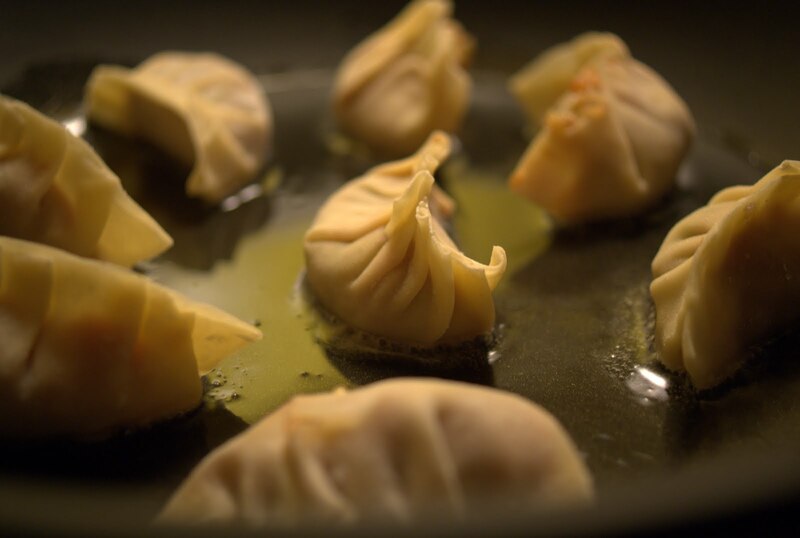 Now that you've created all of your dumplings it's time to cook. Just follow the directions from the recipe. They basically fry on the bottom and then there's a bit of water added, they're covered for a few minutes and they steam to finished. AMAZING FLAVOR. 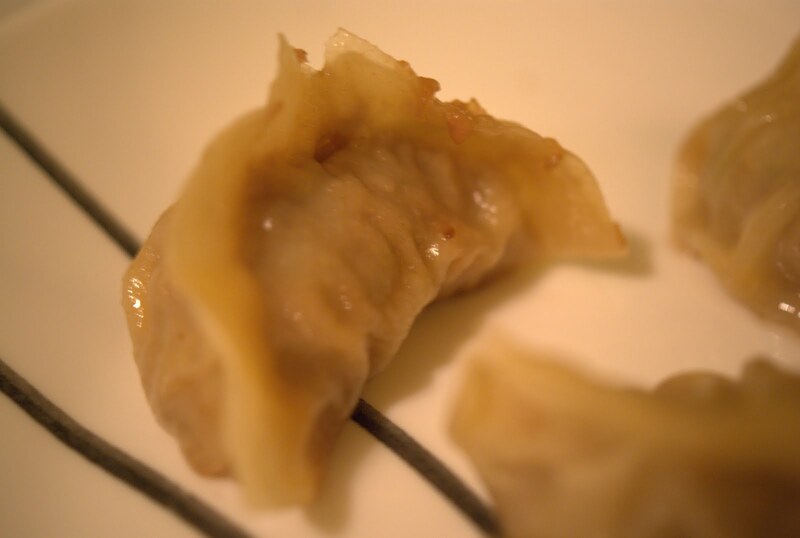 A single bite from the dumpling, lightly dipped in the vinegary sauce that I also lift straight from the recipe, and you have a juicy, savory, fun to eat, and wonderful to make treat. This is fantastic food, and in my opinion served best with beer, rice, or both. Impress your friends at your next party by making these ahead of time. Or simply gorge with someone that can appreciate delicious, homemade Asian food. I love gyoza! Thanks for the pictures of how to do the edges...my first couple always look sad til I get the hang of it again. If I want to make them ahead of time/freeze them, should I cook them first? Or just make and then freeze? I want to take some on a weekend trip this Friday, but I am not sure if I should cook them first/best way to transport. Hi there! When I make a big batch, I usually freeze about half before I cook them. I find that sticking them in a little tupperware thingy, separating the layers with wax paper works pretty well. If you're bringing them Ina weekend excursion, maybe freeze overnight and then just stick a bag of ice right into the container to keep cold while you travel. I hope it works out well!